The conventional wisdom during the 1995-1996 debate on the 1996 Farm Bill, was that exports would again become the driving force in U.S. crop agriculture, increasing at sustained rates not seen since the 1970s. I recently had occasion to review the ten-year projections for agriculture that were made during the mid-90s. In late 1995 and early 1996, all three of the major providers of baseline agricultural projections, the Food and Agriculture Policy Research Institute (FAPRI), the Congressional Budget Office (CBO), and the U.S. Department of Agriculture (USDA) painted similar, very rosy, pictures of crop exports and profitability for the years 1996 through 2005. At the time, I thought the projections, especially exports, were unrealistically optimistic and said so. Today, the numbers appear beyond optimistic. The problem is not that exports are down substantially compared to the early years of the 1990s. They are not. 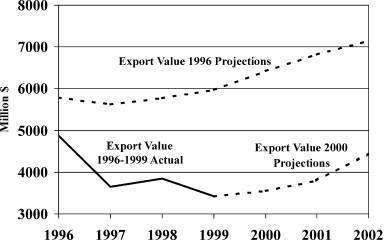 The problem is the export expectations that were being bandied about in 1995 and 1996. If those export expectations had come true, the current farm bill, the last farm bill, or nearly any farm bill would have worked just fine. Well, actually the current farm bill would have been most advantageous to farmers since payments are made even when prices and incomes are “high.” Clearly, economic conditions at the time, including projections based on those conditions, played an important role in determining the shape of the current farm bill. In looking at those expectations, let’s focus on USDA’s February 1996 corn projections for the marketing years 1996 though 2002, the last year of the current farm bill. In our study we compared those projections with the actual data for 1996-1999 and the USDA’s February 2000 projections for 2000-2002. Figure 1 shows corn exports. Annual projections for the 1996-1999 marketing years averaged 400 million bushels per year larger than actual corn exports. When accumulated over the four years, the unrealized exports are equivalent to all of the corn actually exported during the 1997 marketing year. 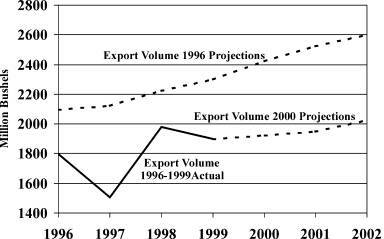 The discrepancies between the two corn export projections for marketing years 2000-2002 are even greater. The 1996 USDA corn export projections for marketing years 2000-2002 average 25% (500 million bushels per year) greater than the respective projections made in February 2000. Most of the discrepancy traces back to overestimates of corn exports to China. Figure 2 shows projected and realized season average corn prices corresponding to the same 1996 and 2000 projection sources used in figure 1. Wow! Wouldn’t it be nice to have prices like those projected in February of 1996? Projected prices did not fall below $2.60 per bushel and were at or above $2.65 per bushel for all but two years. The actual realized season average price for marketing year 1999 was 80¢ below its projected value published in 1996. 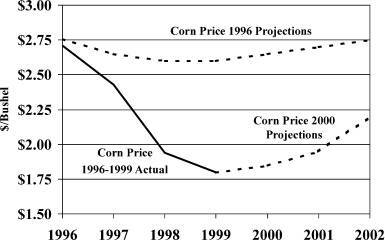 Corn prices dropped each marketing year between 1995 and 1999. This price decline could continue into the 2000 marketing year that is just now beginning. In fact, USDA’s September 12, 2000 projection for the 2000 season average price for corn is $1.50-$1.90. Figure 3 shows the value of exports numbers and it ain’t pretty. With the export volume and prices significantly below the 1996 expectations, the value of exports plummets. For example, the 1999 marketing year value of exports of $3.4 billion would need to be 75% larger to achieve its 1996 projected value of $6.0 billion. From 2000 through 2002 the 1996 projections exceed the 2000 projections by $2.7 to $3.0 billion dollars per year. Keep in mind that had the 1996 projections been correct, crop agriculture would have been relatively prosperous. But, that prosperity would have (temporarily?) camouflaged the more fundamental problem of crop agriculture: its inability to self-correct by reducing output when prices decline and the fact that demand does not increase sufficiently in response to low prices such that inventories are reduced, allowing prices to recover. The bottom line is that we should be realistic about the ability of the export markets to generate sustained prosperity for U.S. crop agriculture. Over the last century, there have only been three time periods in which exports have played that role. Two were during world wars and the third was in the late 1970s and early 1980s. All three export spurts resulted more from external political events or decisions than economic considerations. It is important to remember that countries prefer to grow their own staples, importing only when necessary. Hence, total world-wide export demand responds little to changes in prices. Add to that sticky output response to lower prices by our export competitors and the conclusion is that exports, while important, cannot always be the cavalry that rides in to save U.S. agriculture.